Andree Seu on Delayed, Not Denied answers to prayers. Louis Armstrong AND Danny Kaye! I don’t mean right now. I know that you’ve got nothing better to do than to spend the next half hour listening to me! Or maybe you do have something better to do, but you’re stuck with me right now. I mean in life right now. Are you busy? Busy is the buzzword of our generation. Even though we have so many labor-saving devices at our fingertips, we are more busy than we have ever been. Maybe because we have so many labor-saving devices at our fingertips, we are more busy than we have ever been. Did you know that scientists have now invented a microwave fireplace? You can now have an entire relaxing evening in front of the fire in only 8 minutes. I know you are because you’re in ministry, and that means busy-ness. I’m a solo pastor of a medium-sized local church. And there is so much to do! Preach, teach, counsel, administrate, visit, equip, make calls, run programs, provide vision, raise up elders, lead worship, disciple young leaders, and the list goes on...and on...and on. And that’s before volunteering for district ministries like regional pastors’ groups, constitutions and credentials board, and so on. And trying to work on a doctorate. And raise a family. As if I needed something extra to do, this week I joined Facebook, and now I have a bunch of “friends” to manage! I am busy. Are you busy? You church planters have even more responsibility. Including sweeping the bowling lanes! And as busy as pastors and church planters are, how much more busy are you non-staff church leaders? Lay leaders. I mean, being busy in ministry is my job. But you--you have full time jobs, and then you do your ministry on top of that! I’m sure that you are busy. And thank you for taking the time out of your busy schedules to come to the District Conference. I’m paid by our church to be here, but you are not, and I applaud you for being here and making our family of churches one of your priorities. In fact, as I talk about it, I’ll bet that your mind has immediately gone to your TO-DO list. Whenever I’m away at a conference, my TO-DO list grows like mushrooms in the dark. Is your blood pressure going up as I talk? How do you figure out how to use your time? Because we are all given just the same 168 hours per week. The same 8,736 hours per year. That’s it. We are a limited resource. As a busy person, how do you figure out what to do with your time? Wouldn’t it be great if there were was ONE THING that was a such a tremendous priority that it set all of the other busy-ness things in their rightful place? One EXTRA BIG ROCK to go first into the jar of priorities? You and I both know that there is. ONE THING that does all of that. We know about that ONE THING. But that doesn’t mean we always choose it. Would you turn in your Bibles with me to the Gospel of Luke chapter 10? Our church family at Lanse is studying through the Gospel of Luke this year. And we’ve just made it through chapter 10. There is a 5 verse story at the end of chapter 10 that reminds us what that ONE THING is that should set the agenda for all of our busy lives. I’m sure it’s a familiar story to everyone here. One sister has her priorities right. And the other sister needs her priorities adjusted. I’m not going to say anything new tonight. What could I say to a bunch of ministry people that would be new about Mary and Martha? I want to persuasively remind you of what you already know. We need to choose the ONE THING. “As Jesus and his disciples were on their way, he came to a village where a woman named Martha opened her home to him. She had a sister called Mary, who sat at the Lord's feet listening to what he said. But Martha was distracted by all the preparations that had to be made. She came to him and asked, ‘Lord, don't you care that my sister has left me to do the work by myself? Tell her to help me!’ ‘Martha, Martha,’ the Lord answered, ‘you are worried and upset about many things, but only one thing is needed. Mary has chosen what is better, and it will not be taken away from her’” [NIV]. I don’t know if Mary and Martha fought very often. This is the only story in the Bible where Mary and Martha disagree with one another. But on this day, they had their differences. In her eyes, Mary was falling down on the job. And Martha got busy with the preparations. In ministry! Service to Jesus! This is ministry. Martha was busy in ministry. But Mary, probably Martha’s little sister, just...sat there. Verse 39. That was somewhat unusual for a woman to sit learning at a rabbi’s feet. But this was an unusual rabbi! Can you identify with Martha? Serving is really important! Isn’t it? Yes, it is. The Bible tell us to do it! You are all here because you are servants of Jesus and want to serve Him faithfully. But notice that Jesus does not agree with Martha at this point. Jesus is talking about priorities. He’s talking about the number one priority that out rules all others. In this context, what is that one thing? .... Sitting at Jesus’ Feet. What does that mean? And what does that look like for us in ministry today? My wife says that I can take something simple and make it complex. So, I’m going to take that One Thing and split it into three things this evening to help us to grasp it better and apply it to our lives. If you are taking notes tonight, that’s point #1. Listening to Jesus. Mary was hanging on every word that came from Jesus’ mouth. This sitting at Jesus’ feet was taking the posture of a disciple, a learner. Mary was focused with all of her attention on what Jesus had to say, what Jesus was teaching. Can you imagine being in that class? To listen with your own ears to Jesus’ wisdom and knowledge. To start to see the dawning of the Kingdom of God in His words, the authority with which He spoke, and the tenderness in His voice as He shared words of grace and mercy and truth. Mary sat enthralled by the Master’s teaching. She prioritized listening to Jesus over everything else. Now, this does not mean that Mary never served. It doesn’t mean that Mary abdicated her obligations. I’m 100% sure that when Jesus was done teaching, Mary would have gladly gotten busy with the serving herself. Probably Jesus would have helped Himself! But Mary recognized that serving was not the priority here. The Rabbi of Rabbis was teaching. The Teacher of Teachers was speaking. The Wisdom of God was in the living room. Mary was not going to be lost in the kitchen. Now, the chief way that you and I do that today is by Bible intake. The Bible is Jesus’ teaching. It is how we listen to Jesus today. The Bible is Jesus’ Word. So, if we’re going to be like Mary and sit at Jesus’ feet, we must prioritize our own time in His word. How are you doing at listening to Jesus? How are you doing at listening to Jesus in His Word? I’ve noticed that a lot of people try to have a relationship with Jesus without listening. They think that praying is enough. I talk with people who say that they pray, but they feel far away from God. And they don’t understand why they don’t hear from Him. But all relationships are two-way, aren’t they? There is talking, and there is also listening. And the chief way that we hear from Jesus now is hearing Him in the Bible. So, are you reading your Bible? Do you set aside time to read your Bible? And I mean: NOT FOR SERMON PREP! Not for a class that you are teaching. Just you and the Holy Spirit reading the Bible together for the good of your own soul? Are you studying your Bible? Do you work at trying to figure out what it means? Do you meditate on what you find in there? Do you mull it over and think about it and make it a part of your day and your conversations and your journaling? The EFCA is known for being a family of churches built on the Bible. But...if we don’t read it and study it for ourselves, and listen to Jesus in its pages, our doctrinal statement isn’t be worth the paper it’s printed on. Mary listened to Jesus. She prioritized it above everything else–including even serving Jesus! Sometimes those of us in Christian leadership can make the mistake that Martha did. Martha made the mistake of thinking that serving Jesus was more important that listening to Him! And no wonder we get worried and distracted about ministry! This month, I realized as I was preparing this message that I was worried and distracted about my district conference message about being worried and distracted!!! Because I was not focused on Jesus. I wasn’t listening to Him. He wasn’t my ONE THING. What practical steps do you need to take to prioritize listening to Jesus? Some of us here in this room need to re-establish a quiet time. Or I like to call them a “noisy time.” I’m a noisy fellow. And the Psalms are noisy-not quiet. But what I mean is a time for serious Bible intake. I’ve recently adjusted how I do my Bible reading because I had found that it was getting de-prioritized. It was still getting done, but on the side. Not front and center. So I moved where my reading-Bible sits, and I changed my habits about when it gets read. It now gets read ahead of my novels, ahead of my books for class, ahead of my books for sermon-prep. It’s now first. Front and center. What do you need to do to get the Bible into you? To listen to Jesus? A few years ago my beautiful wife did a complete media fast. No books, no magazines, no radio, no T.V, no internet. Nothing but her Bible for several months. And it profoundly changed her relationship with Jesus. She cut out all kinds of mental-clutter, mental busy-ness. What do you need to do to prioritize listening to Jesus? I’m not telling you something amazingly new, but I’m asking you if there is something you need to do to re-prioritize listening to Jesus? If so, write it down right now and then do it! Because there is nothing more important. One thing is needed–sitting at Jesus’ feet. And that means listening to Jesus. It also means #2. LINGERING WITH JESUS. And by that, I mean that this is not just an academic pursuit. It’s not just teaching for teaching’s sake. It’s not studying the Bible for studying the Bible’s sake. It’s not theology for theology’s sake. This is personal. This is Jesus’ teaching. Mary wanted to be with Jesus. She drew near to Jesus. Not just to theology or to truth or even to the Bible, but to Jesus Himself. Martha was right, you know, about one thing. Mary had “left her” to be with Jesus. Mary had left the kitchen and she was sitting with Jesus. I don’t know what kind of a chair He might have sat in, but she was there lingering in His presence. She was focused on Jesus. This is personal! Mary sat at the Lord’s feet. [SIT] She was right there with Jesus at His feet. How are you doing at lingering with Jesus? Of course, we’re always in Jesus’ presence. Through His deity and the Holy Spirit, Jesus is omni-present, so we can’t get away. How are you and I doing at that? Here’s where I do think about our prayer life. Yes, Martha talks to Jesus, but it’s out of desperation and distraction. She’s stressed out. She is not at peace. She’s not resting. She’s not sitting. She’s not trusting. She’s demanding things from Jesus. That’s not prayer. Martha is not focusing on Jesus. What is your prayer life like right now? Can I recommend a book to you this evening? I love to recommend good books, and this is a great one. This book is called “A Praying Life,” and it’s by Paul Miller, one of my favorite authors. Like you, I’ve read a number of books on prayer, and I can easily say that this is the best book I’ve ever read on prayer. And Heather would agree. The advertising for the book says that it’s a book for “Badly Praying Christians, which is about 95% of us.” Can you identify? This book got me praying as I read it! I believe in this book so much that I ordered 40 of them to bring along and sell this weekend at the district conference. It’s back on the district table in the foyer. I brought them here at no cost to the district and no profit to me. In fact, if you buy one, you are buying directly from Paul Miller’s ministry: SeeJesus.net, and you can make out your checks to SeeJesus or even use a credit card to buy one. They are only $12 a copy and 9 bucks if you buy 10 copies to take back to your church. I highly recommend “A Praying Life.” And I’m even going to offer a 0% discount for the first 40 takers. Why am I selling this book so strongly? And there’s the tie-in with Martha and with our busy-selves. Martha was distracted. She was worried and upset. King James says she was “careful and troubled.” Full of cares and full of troubles. Are you full of cares and full of troubles in ministry? What Martha needed was to linger with Jesus. She needed to rest at His feet. She needed to give over her burdens to Him and listen to Him. What are you worried and upset about right now? The ONE THING that is needed is time with Jesus. Yes, you do. But that’s not the ONE THING that is important. And lingering with Jesus will give you what you need to do your ministry for Jesus. We who are in ministry need to go twice as often to the Living Well, or we will have nothing to serve to our people. Your church needs you to choose the ONE THING needed! Your church needs you to sit at Jesus’ feet before you go trying to serve them. If you don’t, you will run dry, and so will most of them! Because that’s what it comes down to, isn’t it? She has loved Him. She has valued Him. She had adored Him. She has worshiped Him. He is her ONE THING. Martha may have been trying to love Jesus by serving Him. But it’s clear that her focus was not on Jesus Himself. It’s clear because she got so miffed at Mary and even at Jesus! Which is using Jesus, not worshiping Him. And it’s certainly not enjoying Him. Jesus Himself is our portion. And it will not be taken away from her. Sitting at Jesus’ feet was loving Jesus. Treasuring Him above all other things. Mary did that again, didn’t she? A year’s wages?! I don’t how much money you make, but that’s extravagant worship. Perhaps Mary, sitting at Jesus’ feet, had understood what the other disciples had not. Perhaps Mary had understood the gospel! That Jesus was going to die for our sins. And she was anointing Him, preparing Him for burial. She was pouring out all of her treasure on Him because He was worth so much to her. She was, in costly worship, loving Jesus. How are you and I doing at loving Jesus? Do we chose Him above everything else? Are we choosing Jesus as our portion, our One Thing? If we do, it will not be taken away from us. It CANNOT BE taken away from us! Nothing will be able to take it away from us. If Jesus says that He won’t take it away from us, then nothing can! In February, my favorite mother-in-law was diagnosed with terminal cancer. Abdominal cancer of a rare and deadly type. She went in for an emergency appendectomy, and the doctor took a few things out of her and then sewed her up and didn’t expect her to live through recovery. It was a total shock to the family. She is just 59, and they are giving her about a year to live. As you can imagine, this diagnosis has totally changed her busy-ness. She is still busy, but she has a new focus now. Her priorities and the priorities of her family, including my loving wife, have had to change. But it hasn’t ruined or destroyed her no matter how distressing it is (and it IS distressing). But it hasn’t destroyed her. Because she already had ONE THING driving her life. He was already her portion. Her ONE THING. And nothing can take that away from her. She had already chosen (and is continuing to chose) what is better, and it will not be taken away from her. The newest edition of Themelios is out today. I just got done skimming/reading it all the way through. My favorite was Pastor Bill Kynes' thoughts on the beauty of the local church. Amen! I forgot to mention in my last post, that I'm trying to collect at least 200 stories for this phase of this project. Thank you to those who have already sent one in! I need your help, gentle readers. I have begun my the research phase of my doctoral project on gossip, and I need help with the real-life examples side of things. I'm reading books about gossip from all kinds of perspectives: evolutionary theory, sociology, Jewish rabbinic wisdom, Christian self-help books, tabloid journalism, etc. But what I'm missing is the human element. How the sin of gossip becomes attractive (to the speaker and the listener) and destructive (to the one talked about). No names, please! I don't want my project against gossip to be a gossip session itself. - the time you said, "Stop, I don't want to hear this." - or "Have you talked with that person about this?" - the time you chose a "apples of gold in settings of silver" word instead of a "choice morsel." I'm especially interested in the heart that wants to gossip. What was the motivation? Leave a comment on this or email me: pastormatt AT lansefree DOT org. [Matt's Messages] "Jesus Teaches Us to Pray"
The Lord Jesus was a man of prayer. The Gospels tell us again and again that Jesus withdrew from the crowds to pray. He stole away and prioritized time with His heavenly Father. And His disciples could see it. They knew that Jesus was a man of prayer, a man with a hotline to God, a man with a special relationship with God. The Lord Jesus was a man of prayer, and His disciples wanted to know how to pray like Him. V.1 again. “John the Baptist taught his disciples to pray. And Jesus agrees. Jesus would like nothing better than for His followers to know how to pray. Notice that this instruction in prayer immediately follows Jesus’ gentle rebuke of Martha saying that she was upset and worried about many things. But only one thing is needed–sitting at Jesus’ feet. Spending unhurried, uninterrupted, priority-time, lingering with Jesus. And that’s the kind of time that Jesus spent with His Father in prayer. And now Jesus teaches His disciples (and us) to pray. And there are three lessons in this class. #1. BY GIVING US A MODEL TO USE. What do we normally call verses 2, 3, and 4? And by that, we mean that the Lord gave it to us. But it wasn’t the Lord’s Prayer in the sense that He prayed it. It’s the prayer that He gave His disciples. Us. So, it might be better to call it the Disciples’ Prayer. Our prayer. Because it’s a model for all of us to use. Notice that it’s good for anyone to pray. It’s not just for new Christians or old Christians. Or just for adults or just for kids. It’s a prayer that any Christ-follower can (and should) use to pray. You probably noticed when I read it to you that it sounds different in Luke than it does in Matthew. That’s probably because Jesus taught about prayer at different times and in slightly different ways. Good teachers repeat themselves often and make changes in their presentations to really get their points across. And I think that’s another good reason not to just use this prayer as a liturgical prayer where you pray it word for word. Praying the exact words, “Father, hallowed be your name, your kingdom come...” etc. But more importantly, we should use this prayer as a MODEL. As an example. As a template to fit our prayers into. Jesus is a master teacher. And He doesn’t just give us a prayer to repeat, but a template prayer to fit our particular heart-prayers into. Jesus teaches us to pray by giving us a model to use. And the question is: Do we use it as a model? Do you use it as a model for your prayers? Do you pray, “Father,” when you talk to God? Not that you can’t use other words to address God, but do you use that word, “Father” and all that it means? It means that we, who belong to God, are His children. And God is, in a special way, our Father! He is both authoritative (FATHER!) and personal (Daddy!) in our lives. This word “Father” suggests authority and intimacy at the very same time! Do you call God “Father” when you pray? Do you pray “hallowed be your name?” You might not use that word, “hallowed.” We don’t use that word in normal English these days. Do you pray to God as holy and ask that His name be holy? My kids and I have been learning about this prayer at breakfast each day for the last few weeks. Yes! That is what we want. Is that what we want? Sometimes, I just dive right into my grocery list of prayers. Those are all good things to say to God. Do we use this prayer as a model? I told you last week about this book, A Praying Life by Paul Miller. It is easily the best book I’ve ever read on prayer. But Jesus invites us, challenges us, teaches us to pray for God’s Kingdom to come. For things to change here to be like they are in heaven. Here now in part and, someday, in whole! Don’t be afraid to ask for it! Jesus gave this prayer as a model for us to learn how to pray. And that includes verse 3. This is a prayer of dependence. Of neediness. It declares to God that we need things–physical things. Daily bread. Real, physical, needy things. And it’s looking God for those. We depend on God each day for everything. God is inviting us to ask Him for our daily bread. Are you asking God for it? Have you mentioned it to the King of the Universe? Or have you thought that you wouldn’t bother him with your little need? And you’d take care of it on your own. Or hope that someone might notice. Jesus teaches us to pray by using this model. One of the reasons why He likes to give daily bread is to keep in touch with us daily. If we need bread each day, then we’re more likely to seek Him each day. Here’s the biggest battle of our lives. Not with being fed, but being holy ourselves. We need both God’s forgiveness and His power to resist temptation. This is a prayer foo our hearts. For forgiveness, because we cannot pay cost our sins deserve. Only Jesus could pay that cost. And He did on the Cross. And forgiven people are forgiving. That’s why we tell God that we will forgive those who against us. Forgiven people are forgiving. Do you pray that? Do I? Asking God to guide us around temptation and keep us out of harm’s way? This is a prayer that God would give me the power to say, “No!” to the temptations that want to come my way. What are your besetting temptations? Have you asked God recently to keep you from your temptations? We need to use this prayer as a model! Not just sing it in worship services! That can almost lose the force of what kind of a prayer this is. This is a prayer about my heart’s desire being for a Holy Father and His Kingdom to Come and my neediness for both daily needs and eternal needs, physical needs and spiritual needs. And I need to use this prayer as a model for all of my prayer. And not just me alone. Did you ever notice the personal pronouns in this prayer are plural? It’s not “my” daily bread, ‘my sins,” lead “me” not into temptation. It’s “our” daily bread, “our sins,” lead “us” not into temptation. This is a community prayer. This is a prayer for the church together. That’s why we don’t just pray alone. We pray as families. As Link Groups. As Sunday School Classes. As a Prayer Meeting. We pray for each other. And we pray together. Jesus teaches US together to pray using this model prayer. And then in verse 5, Jesus tells a story to encourage us to keep praying. Not pray once and then just give up, but to persevere in prayer. #2. BY ENCOURAGING US TO KEEP ASKING. Listen to His story in verses 5-8.
Who are we in this story? We’re the needy neighbor, right? Who is the one who is like God in this story? It’s the bother neighbor, isn’t it? Because the bothered neighbor has what the needy neighbor is asking for. And, Jesus says, that in the end, that bothered neighbor is going to get up in the middle night and supply the need. Why? Because they are friends? No, verse 8 says it’s not because they are friends. But because (v.8) because of the needy neighbor’s “boldness” he will get up and give him as much as he needs. Is Jesus saying that God is bothered by our prayers? That God sometimes answers like a grumpy sleepy old man? No. Jesus is arguing from the lesser to the greater. God is not like this man. God never sleeps. God is never bothered. God is doesn’t complain when He gives good gifts to His children. He’s only like this man in one way–He will give the needy neighbor what He needs when He comes knocking. So, what’s the point? Let me put it this way – just try to bother God. Go ahead! He wants to be bothered. Knock! That’s what Jesus says as the punchline in verse 9. All three of those verbs are present, active, indicative. That’s just a Greek way of saying that they are all continuous. Keep asking. Keep seeking. Keep knocking. Just try to bother God! That’s what He wants. Jesus is encouraging us to keep asking. Do you ever feel, I do, like you’re always asking God for things? Ask. Don’t be afraid. Don’t give up. Now, does that mean that Jesus will always give us what we ask no matter what? No, I don’t think the Bible teaches that. Sometimes we ask with the wrong motives. And sometimes we’re asking for something that wouldn’t be best. But all too often the mistake I make is not asking enough. #3. BY ASSURING US OF GOOD ANSWERS. If he asks for a Happy Meal, will you give him a cup of Draino? No, we love our children, and we want to give them good things. He says “the Holy Spirit” because the power of the Holy Spirit at work in our lives is the greatest of great gifts purchased by the blood of Christ and generously poured out upon us by our loving holy heavenly Father. And again, if He gives that gift, what good gift would He withhold? Is God like an evil Father? No, He’s the best of Fathers. He is the Father of Fathers. He is where all good Fatherhood gets its name. I want my kids to ask me for good things. Sometimes, I wear down with all of the asking. But our Heavenly Father never does. He never tires of us asking. And He love to give good gifts to those who ask Him. Especially the greatest gift–the Holy Spirit Gift Himself. If were to open up a mic right now, and take half an hour, everyone here could come up to the microphone and tell us a story of a time when God answered your prayer. Everyone of the Christ-followers here has at least one story to tell. Why don’t we give God opportunity for us to have a lot more stories to tell? Jesus is teaching us right now to pray. I've been reading a new blog called One New Branch by an EFCA pastor named Eric Nygren. Today's post is 9 branches that pastors should cultivate. Good for my heart today. We’re back to our series entitled “Certain of Jesus - The Gospel According to Luke.” This is actually the 23rd message in this series, and we’re not even half way through the book yet. But today, we’re just going to advance five verses. One little story tucked into the middle of this great book about Jesus. It’s the story of Mary and Martha. And it’s been a story I’ve been thinking a lot about these last few months because I’m planning to preach on it in a couple of weeks at the district conference in McKeesport. I’d very much appreciate your prayers for me as I prepare my message for that conference. In this story, there is a contrast between two sisters. It’s a tale of two sisters: Mary and Martha. Both are beloved of the Lord. Both are His friends. Both are special women to Jesus. But in this story, one sister has her priorities right and one has her priorities wrong. Let’s read the story. Luke chapter 10, verses 38-42. This is the only story in the Bible where they disagree with one another. And Martha got busy with the preparations. She got to cleaning, baking, cooking, organizing, sending someone to the market for a missed item, polishing the silverware, getting everything ready to please the Master. But Mary, Martha’s sister, just sat there. Verse 39. That was somewhat unusual for a woman to sit at the rabbi’s feet learning. And Mary just sat there. Serving is really important! Isn’t it? Yes it is. What is that one thing? Sitting at Jesus’ Feet. What does that mean? And what does that look like for us today? So, I’m going to take that One Thing and split it into three this morning. She was focused with all of her attention on what Jesus had to say. What Jesus was teaching. Can you imagine being in that class? To listen with your own ears to Jesus’ wisdom and knowledge. To start to see the dawning of the Kingdom of God in His words, the authority with which He spoke, and the tenderness in His voice as He shared words of grace and mercy and truth. Now, this does not mean that Mary never served. It doesn’t mean that Mary missed her obligations. But she recognized that serving was not the priority here. The Rabbi of Rabbis was teaching. The Teacher of Teachers was speaking. The Wisdom of God was in the living room. Now, the chief way that we do that today is by eating God’s Word. Listening to sermons like this one on the Bible. They think that their praying is enough. I talk with people who say that they pray, but they feel far away from God. And they don’t understand why they don’t hear from Him. But relationships are two-way, aren’t they? There is talking and there is also listening. Only One Thing is Necessary – Sitting at Jesus’ Feet. Do you mull it over and think about and make it a part of your day and your conversations and your journaling? Do you listen to the sermon? Do you take heed to what you hear? Mary listened to Jesus. She prioritized it above everything else–including even serving Jesus. She made the mistake of thinking that serving Jesus was more important that listenin to Him! And no wonder we get worried and distracted about ministry! I realized this week that I was worried and distracted about my district conference message about being worried and distracted! There is nothing more important than sitting at Jesus’ feet. Some of us need to establish a quiet time. Or I like to call them a noisy time. A time for serious Bible intake. I’ve recently adjusted how I do my Bible reading because I found that it was getting de-prioritized. So moved where my reading Bible sits, and I changed my habits about when it gets read. Maybe it’s join a Sunday School Class or Link Group or come to Prayer Meeting on Wednesday nights. The details of all of those groups are in the bulletin this week. Because there is nothing more important. 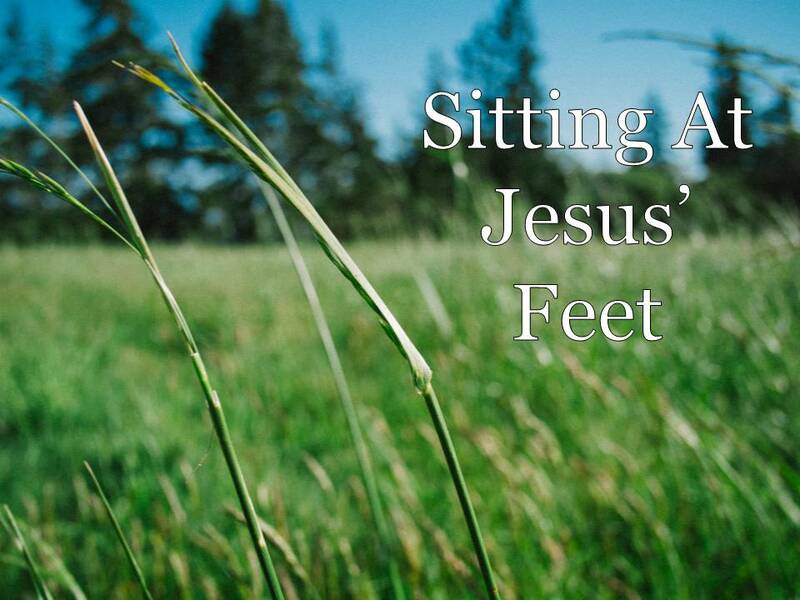 One thing is needed–sitting at Jesus’ feet. And by that, I mean that this is not just a academic pursuit. It’s not teaching for teaching’s sake. It’s Jesus’ teaching. This is personal. Mary wanted to be with Jesus. She drew near to Jesus. Martha was right. Mary had left her to be with Jesus. She was sitting with Jesus. She was lingering there in His presence. She was focused on Jesus. This is personal. Mary sat at the Lord’s feet. How are you doing with lingering with Jesus? Here, I think about our prayer life. Martha talks to Jesus, but it’s out of desperation and distraction. She’s stressed out. She is not at peace. She’s not resting. She’s not sitting. She’s not trusting. She’s not focusing on Jesus. Can I recommend a book to you today? I love to recommend good books. I’ve read a number of books on prayer, and I can easily say that this is the best book I’ve ever read on prayer. And Heather would agree. Most books on prayer make me feel tired after I read them. Oh, I have to do that? And there’s the tie-in with Martha. Martha was distracted. She was worried and upset. King James says she was “careful and troubled.” Full of cares and full of troubles. Martha needed to linger with Jesus. She need to give over her burdens to Him and listen to Him. But, but, but, but I have all this work to do! Yes, you do. But that’s not the one thing that’s important. Sitting at the Lord’s feet. Just plain old loving Jesus. Sitting at Jesus’ feet is treasuring Him above everything else. And that’s what we call worship. It’s clear because she got so miffed at Mary and even at Jesus’ Himself. And certainly not enjoying Him. John says that Judas objected, saying, “Why wasn't this perfume sold and the money given to the poor? It was worth a year's wages." That Jesus was going to die. And she was anointing Him, preparing Him for burial. Do we chose Him as our One Thing? One more thing about this story. I think there is also here, a picture of the gospel. Martha is trying to serve. She’s trying to do something FOR Jesus. And we can get to thinking that salvation comes by our doing things for Jesus. But Mary receives from Jesus. She is a picture of someone who receives a gift of grace. Martha spells things D-O. Do. But Jesus spells things D-O-N-E. Done. He’s done everything for us that we need. Including dying for our sins in our place which is what this table represents. And those who come to this table are not worthy of it. We are not good people who come to serve God. We are sinners who needed to be saved. And Jesus did it for us. Mary is a picture for us of sitting still and letting Jesus do the work. Oh yes, there is a time for serving. But serving comes after sitting. Serving comes after being served. Serving comes after been saved. And it comes out of being saved. If you have received Jesus as your Savior, and are walking with Him, then you are invited to eat and drink this meal with us today. Use this time to linger with Him, thanking Him for all that He has done for you. If you have not received Jesus as your Savior or are not walking with Him right now, then we ask that you not eat and drink this memorial meal with us. Instead, use this time to think about the gospel. About Jesus. About how awesome Jesus is in every way. How worthy He is for us to listen to, to focus on, to love, to adore, to treasure. And how loving He has been to give Himself for you and me. You know, I believe that Martha learned her lesson. Because when her brother Lazarus died, and Jesus came to visit. She was upset because He hadn’t come in time to heal him. She had been listening. She had been sitting at Jesus’ feet. Scotty Smith with a prayer about mental clutter. Matt Frey on an uncluttered life. My bride and our children on Resurrection Sunday. [Matt's Messages] Resurrection Sunday "Missouri Thomas"
John 20 is that great chapter that recounts the story of Jesus’ resurrection from the dead. At the start of the chapter, Mary Magdalene finds Jesus’ tomb empty and is worried that his grave has been robbed. She tells Peter and John, and they run to the tomb and find it empty, as well. John begins to understand and to believe, but Peter is puzzled. And then Jesus appears to all of the disciples on that first Resurrection Sunday, shows them His hands and side, and they are overjoyed. But there was one of Jesus’ disciples who wasn’t there that first Resurrection Sunday. We don’t know where he was, but he wasn’t there when Jesus appeared to the rest of the disciples. And because he wasn’t there, it was very hard for him to believe. We often call him, “Doubting Thomas,” right? When I was boy, we liked to play a game in the car on vacation where we spotted license plates from all the different states. Did you ever play that game? I wanted to turn pro at the license plate game! I loved to recognize a licence plate from half a mile away and rack up the points ahead of my family! It was very competitive. In fact, I don’t think I saw very many of the sights on our vacations, I was too busy trying to rack up the points at the licence plate game. Grand Canyon? No, I must have missed that. But a saw an Alaska license plate! Playing that game, we got to know license plates pretty well. And each state’s plate had its own motto. I was from the humble state of Ohio whose motto was, “Ohio - the Heart of It All!” Very humble weren’t we?! I always loved Pennsylvania’s. I didn’t know that I was going to grow up to be Pennsylvanian, but I loved the PA license plate. Both the keystone shape and the motto, “You’ve got a friend in Pennsylvania,” right?! Okay, here’s a test for you. What was the motto of the state of Missouri on their license plate? Because the other disciples tried to explain to Thomas that Jesus is alive, but he didn’t believe it. He doubted. He chose, in fact, to not believe unless he was given first-hand evidence. “Show me!” his license plate says. Missouri Thomas. Let’s read verses 24 and 25. Now, let’s not be too hard on Missouri Thomas. I mean, do you think that you or I would have done better? Thomas was a very brave disciple. In John chapter 11, Thomas is the one who encourages the other disciples to follow Jesus into danger–being willing to die with him. Thomas didn’t keep that promise and go with Jesus into death, but neither did any of the other disciples, including Peter who had said that he would die with Jesus. Thomas had just seen Jesus be betrayed, arrested, beaten, tortured, ridiculed, and killed. Jesus was dead and buried. Jesus was a corpse. Pardon me for not believing that He is alive! It was easier for the other disciples to believe that Jesus had risen from the dead–they saw him with their own eyes. Jesus is alive, and He knows what Thomas has said. And in grace and love, He brings the proof that Thomas had required. Jesus is alive. Death could not hold him. Doors could not keep him away. And he appears to the disciples with peace on his lips and to Thomas with an amazing invitation. Jesus knew exactly what Thomas had said, and now he lovingly holds out his hand to Thomas and invites him to believe. No, it’s more than that, isn’t it? He demands that Thomas believe. Thomas demanded proof. Jesus demands faith. #1. STOP DOUBTING AND BELIEVE. Jesus insists on faith. “Stop doubting and believe.” I like how the NASB translates this “Be not unbelieving but believing!” Here's your proof Thomas, now believe! Jesus loves us, but he demands our faith. He loves us and He does not allow us room to half-way believe, to disbelieve in Him, to not trust Him. He demands faith of all his followers. And He is still inviting skeptics to consider his claims. You might have been dragged here against your will. Resurrection Sunday is one of those Sundays when people get drug off to church whether they feel like it or not. If you are here and you’re skeptical about the whole thing, I understand. I’ve struggled many times with questions about the reality of the resurrection. If you’re in that boat, let me recommend to you 2 books that have been really helpful to me. This one is called “The Case for Christ: A Journalist’s Personal Investigation of the Evidence for Jesus” by Lee Strobel. And this one is called “The Reason for God: Belief in an Age of Skepticism” by Tim Keller. This one has sold over 2 million copies. This one was in the top 10 of the New York Times bestseller list. Both have been very helpful to me. And to my friends. I’ve got friends right here in this room that went from skeptics to believers because they read these books and worked through the evidence for themselves. Now, that might be a process for of us. For many, many years (even after I had gone to Moody), I struggled with believing in the resurrection. But Jesus would not accept my unbelief. He brought me again and again to consider the evidence for the reality of his resurrection and insisted that I stop doubting and believe. And he does the same with you today. Because Jesus is really alive. It’s as real as if one of us went up and down the rows today showing each other our scars. They were real. Thomas could have done. He could have reached out and touched the nail scars. And Missouri Thomas wasn’t swearing! Thomas was proclaiming his faith in Jesus. He was proclaiming his worship of Jesus! He understood what was happening now. This Jesus is none other than the Lord. None other than God Himself. Notice those personal pronouns. My Lord and My God. He’s not saying that He isn’t the Universal Lord and God of all things. But it’s personal. He belongs to Jesus and Jesus belongs to Him. He worshiped Him as truly as you and I have come this morning to worship Jesus! We aren’t here to memorialize a great and dead saint. Saint Jesus. No, no. We’re here to worship the risen, living Savior–Our Lord and Our God. NO! He receives his worship. Jesus allows Thomas to ascribe deity to Him, to recognize him as his Lord and his GOD! The Risen Jesus receives total worship from Missouri Thomas. And He wants our total worship today. He not only demands faith from us but he receives our worship. That’s why we’re here today. Not just to worship some generic creator God. But to worship the God/Man Jesus Christ! We are Christians! We worship the Lord Jesus, God Jesus! And worship Christ the Risen King! Now, notice what Jesus says next. Jesus has been gracious enough to show himself to Thomas like Thomas had demanded. #2. START BELIEVING AND BE BLESSED. He’s talking about you and me. We haven’t seen, yet we believe. There is a special blessing for people like you and me. You might get the idea that the most blessed people in the world are those who have seen Jesus and believed like the apostles and Thomas and eventually Paul. But that's not what Jesus says! Jesus says that there is a blessing (a special gift of God's grace) to those who believe without seeing him yet! And that’s you and me. We have not seen Jesus yet except with the eyes of faith. We know that He lives, but our eyes have not beheld His risen body, yet. We are waiting, waiting for that. Think about that for a second, the disciples didn't have something (a blessing) that you and I can have by putting our faith in Jesus! Jesus is promising us a special blessing because our faith has not yet become sight. Missouri faith is not as good and blessed as faith without sight. Missouri faith says “seeing is believing.” Jesus says, “believing without seeing is blessing.” We walk, Paul said, by faith and not by sight. Not yet. Peter, years later, reflected on this in his first letter, “Though you have not seen him, you love him; and even though you do not see him now, you believe in him and are (blessed!) filled with an inexpressible and glorious joy, for you are receiving the goal of your faith, the salvation of your souls” (1 Peter 1:8-9). Someday we will see him. 1 John 3 promises, “...we know that when he appears, we shall be like him, for we shall see him as he is.” But not yet. Till then we hope and trust and obey and wait–and are blessed. Missouri faith is not as good and blessed as faith without sight. And that is a wonderful promise for you and me. If you and I believe in Jesus then we will receive this extra blessing, this extra gift of God's grace that Jesus promises. And John goes on to call it LIFE. Look at verses 30 and 31. Start believing and be blessed with LIFE. I don’t know about you, but I’m tired of death. I’m tired of my loved ones dying. My last grandparent died in January. Heather’s grandpa Lundeen died this week. He was 91 and a half and knew the Lord. So, death was great for him. He got to go be with Jesus. But that doesn’t make death good. Death is an enemy. It’s a part of the curse on this world. Death is not the way things should be. I’m tired of the sentence of death hanging over my life and life of all of those I love. And I’m waiting for death to die. You know that death will die one day, right? Death is going to be thrown into the lake of fire, the second death. Death is going to come to an end. We know that Jesus has conquered death and brought life. If you are here today and not yet a believer, I urge you to turn from your sins and put your trust in the Savior, Jesus Christ who died for your sins to bring you to God. And start believing and be blessed. Blessed with LIFE! Worshiping Jesus our Lord and our God. "Our Lord Jesus was a Corpse"
"On a Saturday long ago, our Lord Jesus was a corpse." So begins this brief meditation by Russell Moore. So painfully true. And yet, the emphasis today must be on the word "was." Because now, our Lord Jesus is no longer a corpse. He is alive! When I was boy, we had a record of the song below, and I remember playing it again and again and again until I knew all the words--and rejoicing the whole way.